Stefano Domenicali has resigned as team principal of Ferrari with immediate effect. 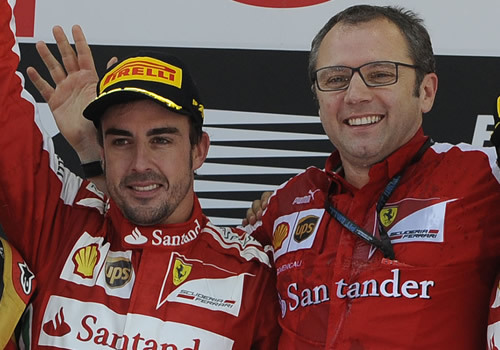 Domenicali, 48, had been in charge since replacing Jean Todt in 2008 and will be replaced by Marco Mattiacci. In what has been a disappointing start to the 2014 season, Ferrari have struggled once again to match the pace of Red Bull and Mercedes, with neither Fernando Alonso nor Kimi Raikkonen registering a podium over the first three races. “There are particular moments in all of our professional lives where you need the courage to take difficult and very painful decisions,” said Domenicali. “It’s time to make an important change. As boss, I take the responsibility – as I always have – for the situation we are going through. “This decision has been taken with the aim of doing something to shake things up and for the good of this group of people that I feel very close to. Ferrari has not won a title since 2008. The Italian team has struggled to compete with Red Bull for the past four seasons and desperately needed a strong start to the 2014 season – but it seems like the new rules and regulations have hampered their progress. Instead, Mercedes and the three teams powered by Mercedes engines have gone on to shine in the early part of the season. Ferrari president Luca Di Montezemolo spoke highly of Domenicali as well as welcoming the appointment of new team principal Mattiacci.